We recommend checking out our discussion threads on the Ikelite DS161 Substrobe and Video Light with Sync Cord, 4061.35, which address similar problems with connecting and setting up Strobe Lights Ikelite. The user manual for the Ikelite DS161 Substrobe and Video Light with Sync Cord, 4061.35 provides necessary instructions for the proper use of the product Photography - Underwater Photography - Strobe Lights. 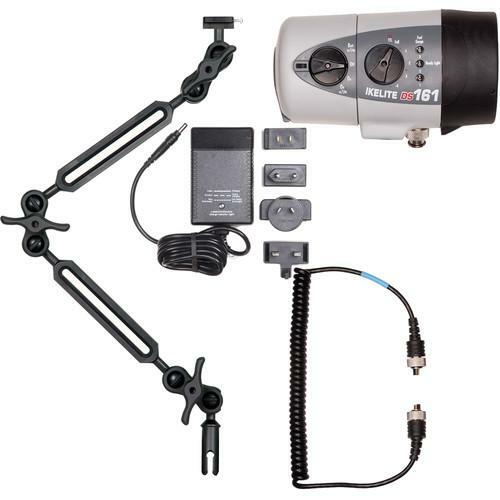 Brighten up your underwater photos of sharks, parrot fish, and coral, and bring out their naturally vibrant colors with this DS161 Strobe and Video Light with Sync Cord, 2-Section Ball Arm, NiMH Battery, and Charger from Ikelite. 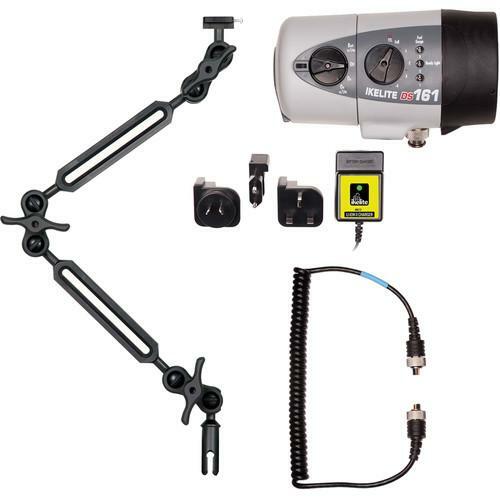 This bundle provides everything you need to connect the flash to your camera's underwater housing and position it for optimal illumination. The TTL / manual DS161 strobe offers a depth rating of 300'. It features a built-in, 500-lumen video light, which shuts off when the flash fires to prevent hot spots. The strobe has a power rating of 160 watt-sec and guide number of 38' underwater and 76' above the surface at ISO 100. The beam has a color temperature of 4800K and a coverage angle of 90°, which is increased to 100° with the included diffuser. A round flash tube and custom-designed reflector deliver soft, even coverage. Benefit from TTL and manual exposure control, with 10 output settings and an SOS mode. A coiled TTL sync cord with two ICS-5 bulkhead connectors is included, and an optional dual sync cord enables you to add a second DS161 strobe or a different flash to your system. The NiMH battery has a fast recycle time of 1.6 sec and produces over 225 full-power flashes on a single charge. Ikelite's quick-release toggle system makes quick, easy work of attaching the battery pack and virtually ensures that flooding will not occur. Additionally, the supplied Smart Charger runs on 100-240VAC power for worldwide use and includes adapter plugs for North America, Europe, UK, and Australia. It switches over to a trickle charge when the battery pack has reached full capacity, in order to prevent overcharging. The status of the charging cycle is indicated by an LED. Ikelite's arm system for this kit consists of two 7", double-ball Mark II arm components, along with 3 ball clamps. Two of the clamps enable attachment to the supplied strobe mount and Ikelite quick-release handle mount, while the last connects the 2 arm sections together. When the entire unit is assembled, the overall length of the arm is close to 30". Optional extra arm components and clamps can be added for greater length and different lighting angles and positions. The ball mounts/joints measure 1" in diameter, and have a groove and o-ring to prevent slipping for a better hold with less force. The arm and its parts are made from aluminum that has been treated with a hard type III anodized finish for resistance to corrosion. If you own a Ikelite strobe lights and have a user manual in electronic form, you can upload it to this website using the link on the right side of the screen. Box Dimensions (LxWxH) 11.3 x 8.3 x 6.7"
The user manual for the Ikelite DS161 Substrobe and Video Light with Sync Cord, 4061.35 can be downloaded in .pdf format if it did not come with your new strobe lights, although the seller is required to supply one. It is also quite common that customers throw out the user manual with the box, or put the CD away somewhere and then can’t find it. That’s why we and other Ikelite users keep a unique electronic library for Ikelite strobe lightss, where you can use our link to download the user manual for the Ikelite DS161 Substrobe and Video Light with Sync Cord, 4061.35. The user manual lists all of the functions of the Ikelite DS161 Substrobe and Video Light with Sync Cord, 4061.35, all the basic and advanced features and tells you how to use the strobe lights. The manual also provides troubleshooting for common problems. Even greater detail is provided by the service manual, which is not typically shipped with the product, but which can often be downloaded from Ikelite service. If you want to help expand our database, you can upload a link to this website to download a user manual or service manual, ideally in .pdf format. These pages are created by you – users of the Ikelite DS161 Substrobe and Video Light with Sync Cord, 4061.35. User manuals are also available on the Ikelite website under Photography - Underwater Photography - Strobe Lights.